The 2010 World Series was the 106th edition of Major League Baseball's championship series. The best-of-seven playoff, played between the American League champion Texas Rangers and the National League champion San Francisco Giants, began on Wednesday, October 27, and ended on Monday, November 1, with the Giants winning the series 4–1 to secure their first World Series championship since 1954 and their first since relocating to San Francisco from New York City in 1958. In their respective League Championship Series, the Rangers and Giants had eliminated the 2009 World Series teams, the New York Yankees and the Philadelphia Phillies, each in six games. The Rangers' victory in the ALCS gave the franchise its first World Series appearance in its 50-year history, dating from their inauguration as the second Washington Senators club in 1961. Meanwhile, the victory in the NLCS gave the Giants their fourth World Series appearance since moving to San Francisco prior to the 1958 season; their most recent appearance had been in the 2002 World Series, when they lost to the Anaheim Angels in seven games. Coincidentally, the Giants and Rangers faced off in the first regular-season interleague game, on June 12, 1997, at the Ballpark in Arlington; current Ranger reliever Darren Oliver, in his first stint with the club, threw the game's first pitch. San Francisco landmarks, such as Coit Tower, the Ferry Building, and San Francisco City Hall, were illuminated with orange lighting at night during the postseason. An exclusive VIP party was held on the eve of the World Series at the California Academy of Sciences (in Golden Gate Park); most media were not allowed near the event. San Francisco mayor Gavin Newsom made a friendly wager with Arlington mayor Robert Cluck, agreeing that "the losing city's mayor will travel to the winning city and join the winning city's mayor in a day of support for local youth and community service initiatives, with both mayors wearing the jersey of the World Series Champion team." With three games slated in Arlington, this marked the fifth time the same city hosted both a World Series game and the upcoming Super Bowl (Los Angeles 1966–67, Minneapolis 1991–92, Atlanta 1999–2000, Tampa 2008–09). In the offseason, Joaquín Árias to the New York Mets in exchange for Jeff Francoeur. Like the Rangers, the Giants and their fans have had a long history of futility and disappointment since their move from New York City to San Francisco before the 1958 season. The Giants had won their last World Series against the Cleveland Indians in 1954. After the move, they made it to the Series three times but lost each time. These included a seven-game loss to the New York Yankees in 1962, a four-game sweep by their cross-bay rival Oakland Athletics in 1989 that was marred by the Loma Prieta Earthquake, and another seven-game loss to the Anaheim Angels in 2002 after being five outs away from the title in Game 6 with a 5-0 lead. Their last postseason appearance was in 2003, when they lost to the eventual World Series champion Florida Marlins in the NLDS. The Giants spent much of the early part of the season in second or third place in the National League West standings, trailing the San Diego Padres and on occasion the Los Angeles Dodgers or Colorado Rockies. They entered the All-Star break in fourth place, trailing the Padres, Rockies, and Dodgers. However, they finished July in second place behind the Padres, with a win–loss record of 20–8 for the month. On August 26, the Padres began a ten-game losing streak that allowed the Giants to gain some ground. The Giants tied the Padres for first place on September 10 and the two teams traded the top spot for the next 15 days. Then, the Giants took the lead for good on September 26, when they began a four-game winning streak coupled with the Padres' three-game losing streak. The Giants were three games ahead of the Padres going into the final weekend of the season, a three-game set between the two teams that the Padres needed to sweep in order to force a tie-breaker. The Padres won the first two games, but the Giants prevailed in the final game, 3–0, to clinch the franchise's seventh NL West championship. In the Division Series, the Giants faced the wild card-winning Atlanta Braves, who had also clinched a postseason berth on the last day of the regular season. Each game was a one-run victory for each team, with the Giants winning the series three games to one. The Giants won behind Lincecum's 14 strikeouts in Game 1 and come-from-behind wins in Games 3 and 4. In the NLCS, they were heavy underdogs to the two-time defending National League champion Philadelphia Phillies. Ross' two home runs in Game 1 off Phillies ace Roy Halladay helped the Giants win the opener 4–3. They lost Game 2, but rebounded in Game 3 thanks to Matt Cain's strong performance and more timely hitting by Ross. Game 4 saw the Giants winning on a walk-off sac fly by Juan Uribe. With the Phillies winning Game 5, 4–2, the series was sent back to Philadelphia. The Phillies took a 2–0 lead in the first inning of Game 6, but the Giants tied the game in the third and their steady bullpen held the Phillies' offense in check the rest of the way. This effort by the Giants's bullpen included relief appearances by Tim Lincecum and Madison Bumgarner, who were both part of the Giant's playoff rotation. 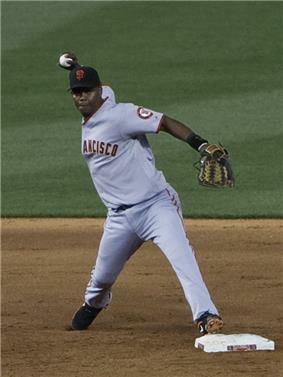 In the eighth, Uribe hit a home run to right that barely cleared the wall and gave the Giants a 3–2 lead. Wilson came on for a five-out save in the eighth to clinch the series. This marked the first time that the NL West champion had made it to the World Series since the Arizona Diamondbacks did so in 2001 (the Giants' 2002 appearance and the Colorado Rockies' 2007 appearance were both as wild card winners). In Game 4, the Giants sent 21-year old rookie Madison Bumgarner to the hill against the Rangers' Tommy Hunter. Bumgarner was brilliant for San Francisco, hurling eight shutout innings while allowing only three hits. Bumgarner allowed only one Ranger to reach second base. A two-run homer by Aubrey Huff in the third inning off Hunter was enough for the Giants win. The other two runs were scored on a run-scoring double by Andrés Torres in the seventh and a home run to dead center by Buster Posey in the eighth. Bumgarner also became the fifth youngest pitcher to start a World Series game, and the fourth youngest to win one. Bumgarner and Posey were the first rookie battery to start a World Series game since Spec Shea and Yogi Berra in 1947. Sunday Night Baseball for ESPN television since 1990) would work together, as the network subsequently announced that their contracts would not be renewed for 2011. ESPN Deportes Radio also aired the Series to Spanish language listeners, with Eduardo Ortega and former Giants pitcher Juan Marichal announcing. In the UK, the Series was broadcast by BBC Radio Five Live Sports Extra, with Jonny Gould and Josh Chetwynd commentating. 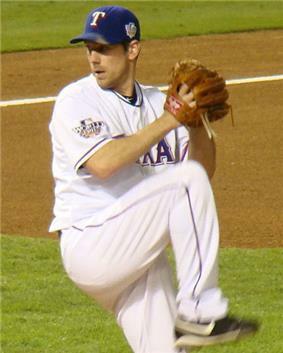 The next season, the Rangers won the AL West title for the second consecutive season, after leading that division for much of the season, eventually making it back to the World Series against the St. Louis Cardinals, losing to them in seven games, after being one strike away from the title, twice in Game 6. The Giants, however, would miss the playoffs, surrendering an early lead in the NL West and ultimately finishing behind the Arizona Diamondbacks. The 2011 Giants became the first defending World Series champion to miss the playoffs since the 2007 St. Louis Cardinals. 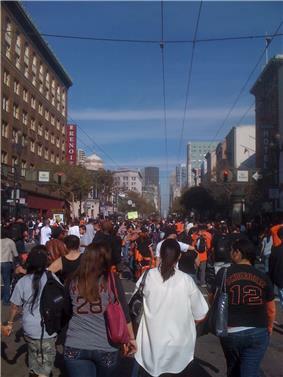 The Giants would return to form in 2012, winning the 2012 World Series. ^ Walker, Ben (October 25, 2010). "AP source: World Series umpires include 1st timers". Yahoo! Sports. Associated Press. Retrieved October 25, 2010. ^ "2010 World Series". Baseball-Reference. Retrieved January 6, 2014. ^ a b c d e f Scott, Laurence (November 1, 2010). "Giants Bring World Series Championship to West Coast". NBCBayArea.com. Retrieved November 2, 2010. ^ Sarah B. (October 26, 2010). "VIP Giants bash at the Academy of Sciences tonight. Fireworks!". Richmond SF Blog. Retrieved October 27, 2010. ^ "Newsom makes friendly wager on World Series". abclocal.go.com. October 26, 2010. Retrieved October 28, 2010. ^ Araton, Harvey (October 14, 2010). "Out of a Failed Drug Test Came Team Unity". The New York Times. Retrieved November 3, 2010. ^ Nightengale, Bob (October 27, 2010). "Giants bats erupt against Lee; win Game 1 vs. Rangers 11–7". ^ "Recap: San Francisco vs. Texas". USA Today. October 28, 2010. Retrieved November 3, 2010. ^ a b "Recap: Texas vs. San Francisco". USA Today. October 31, 2010. Retrieved November 3, 2010. ^ Haft, Chris (November 1, 2010). "Madison avenue! Giant road show makes it 3-1". mlb.com. Retrieved November 1, 2010. ^ "Recap: Texas vs. San Francisco". USA Today. November 1, 2010. Retrieved November 3, 2010. ^ "Rapid Reaction: Giants are champions". ESPN. November 1, 2010. Retrieved November 5, 2010. ^ "Recap: Texas vs. San Francisco". USA Today. November 2, 2010. Retrieved November 3, 2010. ^ Gonzalez, Alden (November 29, 2010). "Giants, Rangers collect their Series shares". Baseball Almanac. Retrieved November 29, 2010. ^ "The World Series Is Truly Global With An International Audience". Fang's Bites. October 27, 2010. ^ "ESPN America TV Schedule". ESPN America. October 27, 2010. Retrieved October 27, 2010. ^ a b McElroy, Tom (October 30, 2010). "Fox, Cablevision reach agreement to end blackout". Yahoo! Sports. Associated Press. Retrieved October 30, 2010. ^ "Steelers-Saints tops World Series in ratings". Pro Football Weekly. November 1, 2010. ^ Schulman, Henry (November 9, 2010). "Jon Miller, Joe Morgan out after 21 years at ESPN". San Francisco Chronicle. ^ Smith, Matt (October 27, 2010). "A guide to the 2010 World Series". BaseballGB. Retrieved October 18, 2011. ^ Walker, Ben (November 2, 2010). "Giants win World Series behind Lincecum, Renteria". Yahoo! Sports. Associated Press. Retrieved November 2, 2010. ^ a b Waldstein, David (November 4, 2010). "After 52 Years of Waiting, One Delirious Day". New York Times. Retrieved November 17, 2010.